Chew toys naturally get lumped into the “toy” category, but the truth is they are much more than that. And if you're looking for some of the best chew toys for your dog, there are a few important things you'll need to be aware of. Chewing is important for your dog’s mental and oral health. It’s also incredibly important to your wallet, especially in the beginning stages of your puppy’s life. This is because if your dog doesn’t have something else to chew on, it may turn its head to your furniture, books, DVD’s and other things that you’d likely prefer they didn’t chew on. Additionally, choosing the wrong chew toy may cause harm to your dog. It’s always important to keep safety concerns in mind when it comes to your dog. In my opinion, everything your dog puts in his mouth is a safety concern. Call me neurotic, but there are just so many possibilities for your dog to get hurt while it’s chewing: choking, infections, trouble with digestion, and even breaking a tooth. For these reasons, most people should pay much more attention to what types of toys they give their dog than they currently do. Possibly the most common type of chew toys are rawhide bones. These are usually a layer of cattle skin that has been processed into sheets and formed into the shape of a bone. These are good, inexpensive and satisfy a lot of your dog's deeper chewing instincts, which is always a good thing. They're made of cattle products (usually dried hide); so just be aware that some companies use more chemicals, and you should probably look for a more naturally dried option. Since chewing is so important, it’s important to invest in a strong, durable, healthy chew toy. There are several different directions you can go to get a quality chew toy. Bully sticks are great really. Sometimes people lump them into the same category as rawhide bones or pig ears, and while they do come from an animal, they just aren’t the same. 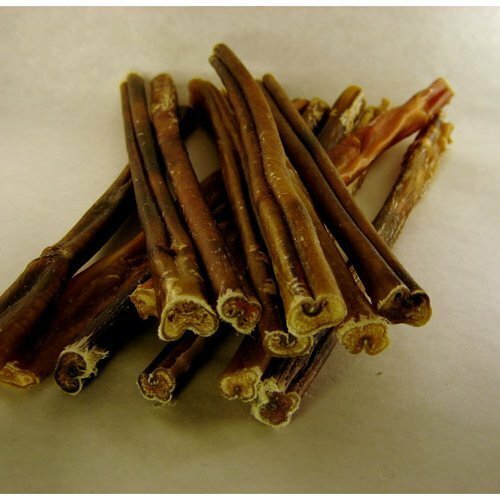 Bully sticks are made from bull penises (yes, really) that have been washed and dried out. This does cause a slight health concern because the sticks could have bacterial contamination, but it’s not likely it would harm your dog. Also, this is a natural, degradable product, so after it gets too small, you’ll have to it away from your dog to keep him from choking on it. This sort of chew toy has generally been able to keep dogs entertained for about 30 minutes or so at a time. Himalayan chew sticks are another great choice for a chew toy. For starters, they taste absolutely amazing. In my opinion, they rank 10/10 on the YUM scale (no, I didn’t try one… I promise). My dog loves them though! They are literally hardened cheese chew. They are natural delicious, and there aren’t many health concerns. Generally, you want to make sure you don’t let it get too small or else you dog could choke on it, but that’s true for just about anything. Lastly, rubber chews are always a great choice, one of the best choices in my opinion. This shouldn’t be confused with latex or vinyl chew toys. Rubber chew toys are usually a little more expensive, but they also last for several years. They are fantastic. One of the only drawbacks is the dog usually doesn’t get a sense of accomplishment when chewing on the rubber chew toys. They’re basically indestructible, so it’s not the same as getting a pig’s ear or a bully stick. The dog can’t degrade the toy over time, so they get tired of the rubber chew toy sometimes. However, if you go with a brand like Kong, you can put food inside of the toy. This will keep the dog occupied for a long time; also you can reuse it over and over again unlike chew toys that deteriorate. Here Are Some of the Best Toys for Dogs Who Love to Chew! If you have a dog, chances are you have heard of Kong. They are industry leaders in dog toys, and they are known for making some of the most durable, high-quality dog toys on the market. This is their classic chew toy. It’s excellent for keeping your dog entertained. You can fill it with peanut butter or some sort of treat, or you can play fetch with it and take advantage of its unpredictable bounce. Either way, we’re sure you’ll love the Kong Classic, and we’re positive your dog will. Lastly, the great thing about Kong is the toy will last for several years; they’re indestructible. Remember when we said a safety concern may be the added chemicals in the bully sticks? These sticks don’t necessarily eliminate the problem, but it cuts it down by a lot! These bully sticks are all natural, free range sticks that are from free range cattle in the USA. They are high in protein and low-fat. They also have plenty of other health benefits like helping keep teeth and gums healthy and helping the dog keep a lean body. If you’re going to go with bull stick, I’d recommend going with this best seller! These things are actually pretty cool. They’re extremely high-quality and they’re made with real, all-natural ingredients: yak and cow milk, salt, and lime juice. They even guarantee almost 530% proteins in the pack. Additionally, they have no preservatives, it’s low in fat, and all of the bars weight about 11.5 ounces. They are put through a unique process when they’re made. The yak and cow milk are mixed, boiled, and then dried for several weeks to create a hard chew. The company claims it’s an archaic recipe from the Himalayans. 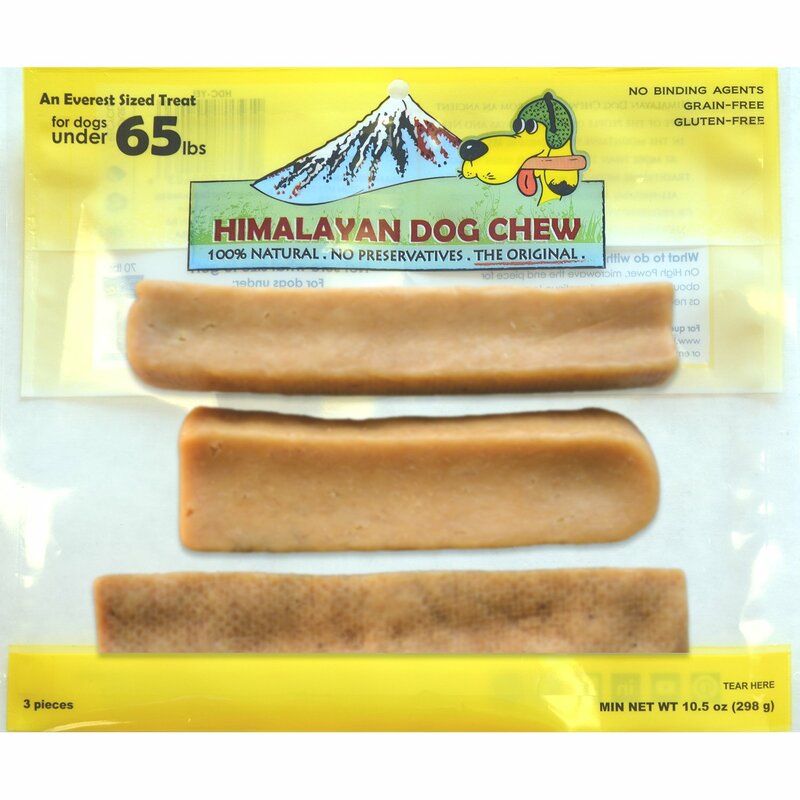 Whether that's true or not, I recommend this product if you’re looking for Himalayan dog chews. Your dog will love them, and you won’t regret it! This chew toy is definitely versatile. It can do just about anything, and it serves plenty of different purposes. First, in addition to being a chew toy, it comes with patented Denta-Ridges to reduce plaque, clean teeth and gums, and reduce food build-up. 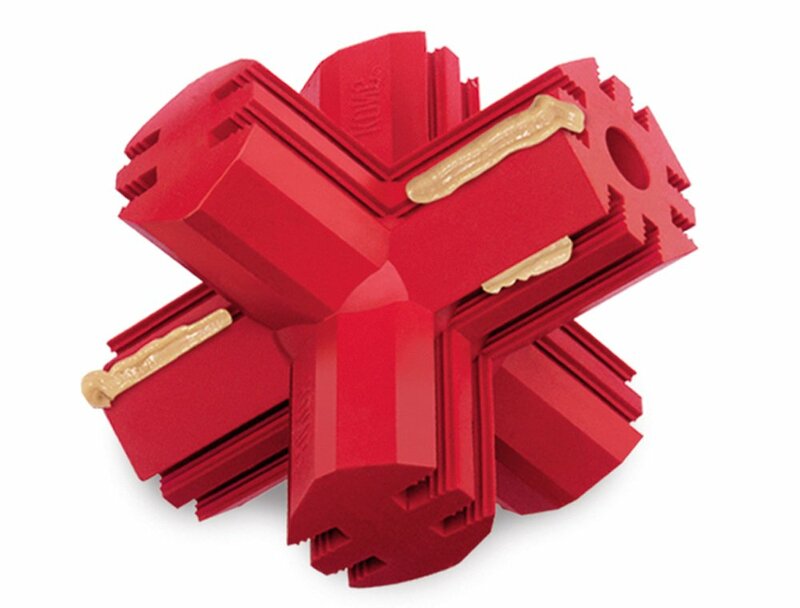 It’s made in the USA with the same heavy-duty rubber as the other Kong dog toys so you know it will last for years. 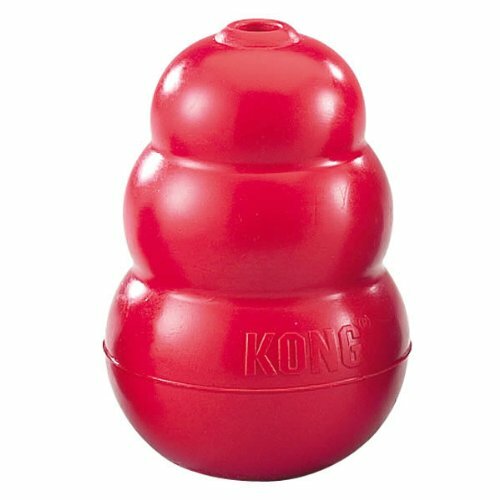 Really, we recommend KONG products pretty much any time we write about dog toys. They're just super high-quality, and our dog really, really loves hers. It's not out of the ordinary to hear it go bouncing across the floor and see her chasing after it.